Ishigaki Rin was born in Tokyo and lost her mother at the age of four. She had three mothers-in-law by the time she was eighteen. After graduating from elementary school at fourteen, she got a job as a clerk for Nihon Kogyo Ginko (The Industrial Bank of Japan). From then on until her retirement for forty-one years, she worked hard to support her family in the chaotic period before, during, and after World War II. She adeptly divided her time between office work and writing poetry, so she was sometimes called “a bank clerk poet”. Her first book of poetry, Watashi no mae ni aru nab to okama to moeruhi to (A saucepan, a rice cooker, and a burning fire before me), was published in 1959. Her second one, Hyosatsu ado (A nameplate, etc), got the H-shi (Mr. H) Prize in 1969. 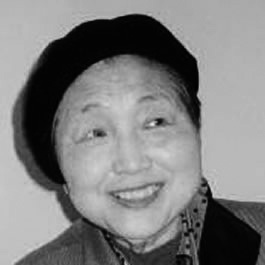 She published her first book of essays, Yumoe no sakoku (The exclusion of humor from our ethos), only to prove herself a superb essayist, as well, in 1973. Even though she was not a prolific poet she left behind a handful of memorable masterpieces for poetry-lovers in Japan. Florinea A. Chad is a nom de plume of a private translator living in Japan.